Last year, during the second stretch of underemployment that I’d fumbled through in as many years, I decided to begin keeping a planner to lend direction to my days. An aggressively employed, slightly older friend suggested that I take up “bullet journaling” – a framework for agenda-keeping, they said, that should be doubly appealing to me and my quest for agency and a responsible life. To start with, the system prescribes a blank notebook, which is cheaper than a pre-organized planner. In the second place, it had been calibrated to optimize its users’ productivity through its efficient design. The friend sent over a link to a tutorial on how to set my own journal up, and I clicked through. A few sentences in, my eyes glazed over. I closed the tab. The learning curve would be too high, I ruled. Even for someone who was underemployed. Despite my rude tendency to dismiss my friends’ productivity fetishes (my moon, I reason, is not in Capricorn), I nevertheless found myself not alone in my assessment. If acquaintances around whom I mentioned bullet journaling did not claim a vague familiarity with the practice, then they had tried to adopt it – and, like me, had quickly given up while watching a tutorial, insufficiently buoyed by their good intentions. It was evident that bullet journaling was for people with a specific type of drive, and a dedication to living efficient lives. In my own life, I went to Muji and bought a pre-organized, seven-dollar planner. Bullet journaling’s high learning curve accounts for the impressive number of YouTube videos devoted to demonstrating how to set the system up. Sub-genres abound, but in general, these videos unfold predictably, opening with a greeting that is delivered with the affable cadence and second-person address that is standard to the YouTube tutorial genre. The focus then converges on a tableau of art-in-the-making laid across the screen, not unlike the ones featured in the illustration sequences of British children’s television series Art Attack: an open, blank-paged notebook; pens of varying tip sizes; two disembodied hands; a gentle voice narrating the marks that are made upon the sheets. An index is laid out, as are the bones of various “logs” (daily, monthly, rapid, future). An unobtrusive piano track, perhaps interspersed with placid ping-ping sounds, might be playing throughout. 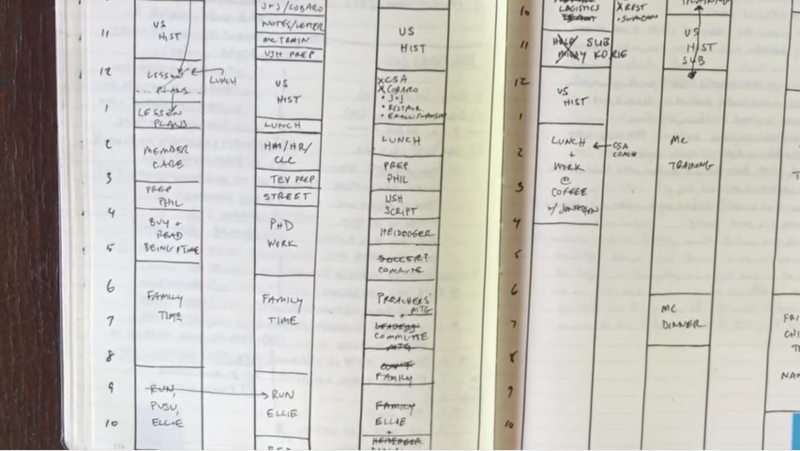 The bullet journal was introduced in 2013 by Ryder Carroll, a New York-based digital product designer who offers a modest origin story for the system. In 2007, Carroll says, he explained his planner scheme to a friend who was distraught from wedding logistics. She was into it. Six years later, he launched bulletjournal.com to explain the system to more people. They were into it, too. Since the website’s launch, the system’s been adopted by an ever-mounting number of people, many of whom actively participate in a swath of BuJo communities across the net. Their demographics include graduate students, people interested in tracking their health, fitness junkies, parents, general fetishists of busy-ness, earth signs, and scrapbookers. As a whole, BuJo users are an affable bunch, convening online to offer each other customization tips, post pictures of their own layouts, and function as cheerful audiences for one another’s paths towards organized futures. For a practice that is so facilely redolent of Fordism’s ruthless efficiency fetish, not to mention Silicon Valley’s – Carroll’s system coasts, after all, on a parable of innovative, diversely-applicable design as the seed for optimal productivity – bullet journaling has attracted a surprisingly benign cast of devotees. It is also welcoming of women. On YouTube, the most popular BuJo tutorials are hosted by women, who are also the most vocal – or at least, visible – champions of the aesthetic sensibility that outsiders tend to conflate with bullet journaling. This sensibility is marginalia-heavy, and inclined towards “themes” like “cityscapes,” “gardens,” and “popcorn movies.” Themed BuJo tutorials quench a primal fascination for watching, but not actively colluding in, objects being constructed to completion. In the videos, accidental ink blobs are transmogrified into deliberate rococo blossoms; small, stiff brushes are used to make letters look as if they are imparting individual shadows. To watch one is to invoke the stupefying experience of watching Bob Ross paint, but with watercolours instead of oils. Washi tape takes the place of alarmingly gentle landscapes. As with my parents at the time, some BuJo users find this sensibility confounding. Somewhere between adopting an organizational practice designed to minimize the amount of time you waste, and devoting long stretches of time to aestheticizing that practice (a themed, monthly BuJo layout could easily take a couple of hours to set up), the thread got lost. “Not ‘for girls’” was evidently the encouragement that many aspiring BuJo users, paralyzed by their lack of artistic skill or interest, needed in order to proceed. “I needed to read this,” says one such person, on the same Reddit thread. “I gave up my bujo because I got entrenched in the more artsy/scrapbooking end of things and it completely overwhelmed me.” Says another Redditor: “As a guy who started a BuJo yesterday thank you. Mine is super minimalistic and I was kind of blown away by all the girls with fancy tape and stuff.” Other /r/bulletjournal/ threads, like “When does a bullet journal stop being a bullet journal?” and “Bullet journaling is supposed to help people be more productive. But I often think that these artsy ones are just their own form of procrastination” are similarly tinged with sentiments of inadequacy, and, as their titles would suggest, passive aggressiveness. “Girly” had clearly been reified as shorthand for a particular degree of aesthetic devotion, one that appeared to defy the things Carroll’s original system stood for: efficiently-wrought productivity; a better organized life. The antidote to this misstep, obviously, was Bullet Journaling For Men. A phenomenon that is real and that, like any real phenomenon, requires role models. Communities. Arbitrary speciality products. Support groups? But what does it all mean? What, exactly, is bullet journaling for men? “As you see, there’s nothing pretty about my journal at all. The thing is grey, to start with,” says Andy in his tutorial, lending credence to the guess that the most predictable answer is also the correct one: no decorative flourishes. No drawings. No washi tape especially. In short, the exact opposite of the intricately-wrought, “girly” bullet journals with which bullet journaling itself has been conflated. Having tasked himself with providing this perspective, he describes how a guy’s bullet journal might look: without frills, purely functional. And then, about three minutes in: a turning point. On the page across which Matthew had laid out his key – a plain dot denotes a task, a dash a note, a plus sign an idea, etc. – one sees a drawing of a literal key, sketched out and filled in with tangible care. Matthew is quick to explain. So there you have it. In spite of all their assurances that it’s fine, people can decorate their journals however they want – a sentiment invariably expressed in every Bullet Journaling for Men post or tutorial – the men who want to know How Men Bullet Journal are not actually 100% fine. They’re anxious. Anxious to take up a practice that might cast them as trivial or too concerned with aesthetics; that might confer upon them the same judgment that they hold towards women. So. Bullet journaling for men. Minimalist? Yes. Steeped in masculine anxiety? That, too.